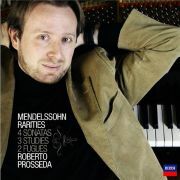 Roberto Prosseda completes his 10-years project of recording all Mendelssohn Piano Works. 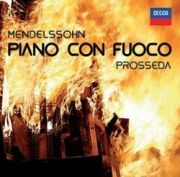 This 3-Cd Album, released in April 2014, includes all the Variations, Preludes and Fugues, Etudes, Klavierstücke not yet recorded in Prosseda's previous CDs. The Album contains 29 World Premieres, including 4 Rejected Variations sérieuses. 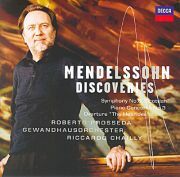 Mendelssohn: Piano Quartets op. 1 and op. 3. 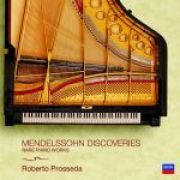 This 2-CD album includes all the Piano Sonatas, Fantasia, Capriccios composed by Mendelssohn, excluding the recent discoveries already recorded by Roberto Prosseda in his prevoius Decca CD's. CD 2: Rondo Capriccioso op. 14, Fantasia op. 15, 3 Fantaisies ou Caprices op. 16, 3 Capricci op. 33, Scherzo in B minor, Capriccio op. 5, Capriccio in F sharp minor (1837), Capriccio op. 118. 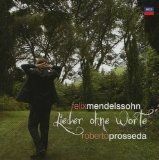 First Complete Recording of Mendelssohn's 56 Lieder ohne Worte. 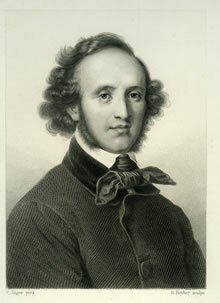 Mendelssohn: 4 Early Piano Sonatas (1820), 3 Etudes (1820-21), 2 Fugues (1823-26).